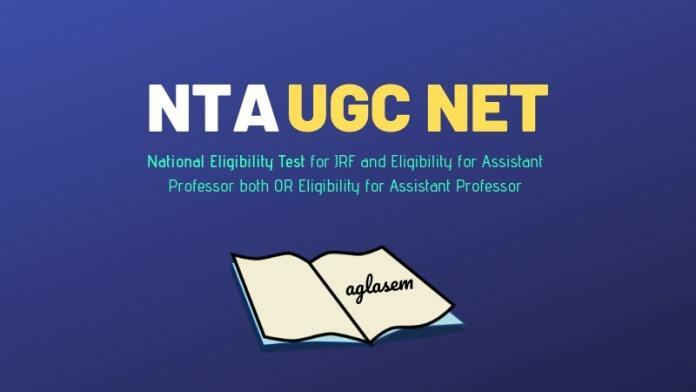 UGC NET 2019 – National Testing Agency (NTA) is organizing University Grants Commission (UGC) National Eligibility Test (NET) exam. The computer based test is on 20, 21, 24, 25, 26, 27, and 28 June 2019 as per revised syllabus. NTA UGC NET is taken by candidates who have done their Masters in Humanities including languages, and Social Science. Qualifying this exam makes one eligible for Assistant Professor or for Junior Research Fellowship and Assistant Professor. Get here complete details of UGC NET 2019 including exam date, admit card, syllabus, question papers, answer key, result. The first UGC NET exam in the year 2019 is in June. All important dates of UGC NET 2019 are given below. Candidates can download admit card for UGC NET 2019 at on the official website ntanet.nic.in. The admit card contains exam date, shift, roll number, exam center, timing, and candidate details. If admit card is available when you are visiting the website, then you can locate admit card download link. Click it. See your details on screen. Then click download your admit card link. A hard copy of UGC NET 2019 admit card. Passport size photograph same as uploaded in application form. One valid photo identity card (PAN card, Driving License, Voter ID, Passport, Aadhaar Card. Here is the exam pattern of UGC NET 2019 exam. It is vital to understand it for preparation. This time, the syllabus of UGC NET for all the subjects has been changed, including General Paper on Teaching & Research Aptitude (Paper -I). The candidates appearing for the UGC NET 2019 Examination they must know about the UGC NET Syllabus 2019. Syllabus plays a vital role when the candidates prepare for the examination. From the syllabus, candidates got to know about the subjects name, topics name. Click at the below-provided link for checking the detailed syllabus of UGC NET 2019. NTA will declare the result of UGC NET 2019 at the official website. For checking the result candidates may need to provide the login details in at the login page. The result will contain the name, roll number of the qualified candidates. The candidates who will score minimum qualifying marks in the exam those will be considered as the qualified candidates. The result will be purely based on the performance of the candidates in the UGC NET 2019 examination. NTA announces UGC NET cutoff with the result. On the basis of it, the candidates are selected for JRF and Assistant Professorship. Candidates use online mode for doing the registration of UGC NET 2019. In the online application, form candidates provided the valid details. In the form, candidates have to mention the personal, contact, educational, qualification details and need to upload the photograph and signature. The applicants should note that the fee is non-refundable. Mode of Payment- The candidates can make the payment by using two modes i.e. online or offline. The candidates who want to make online fee payment can do it so by using Debit Card/ Credit Card/ Net Banking/ through SBI / HDFC / Syndicate / ICICI Payment Gateway. This year for the first time Candidates belonging to Economically Weaker Sections (EWS) will be given reservation For Higher Education but for that in the form such category candidate have to select category and upload respective certificate. Before filling the application form candidates should first read the eligibility criteria because if the candidates will fill the eligibility criteria then he/she will be considered for the further process. Check the detailed eligibility criteria of UGC NET 2019 from below. Age limit JRF: Candidates age should not be more than 30 years as of July 01, 2019. Candidates must have a masters degree and at least score 55% marks in masters degree or 50% marks if they belong to SC / ST / OBC / PWD category. The candidates who are pursuing a masters degree or those who have appeared (final year) and are waiting for result are also eligible. However, they will be admitted provisionally and they will be eligible for JRF / eligibility for Assistant Professor only after passing masters degree with scoring minimum passing marks as described above. They should complete masters degree within 2 years of declaration of UGC NET 2019 result. Applicants having Ph.D. degree whose masters level was completed by September 19, 1991, will be eligible and they will be given the 5% relaxation in aggregate marks for NET. National Testing Agency is has propounded with a vision to conduct fair, organized, and transparent entrance examination in Indian. NTA took over responsibility from the Central Board of Secondary Education (CBSE) and successfully conducted UGC in December for 956837 candidates, in 235 cities. Out of the registered, 47884 candidates qualified for the exam. For now, other then UGC NET, NTA is looking after conducting JEE Main, NEET, CMAT, and GPAT. For more details on UGC NET 2019 download information brochure from here.